Tollens and the plays by Pigault-Lebrun. At the start of his literary career Dutch author Hendrik Tollens was very much involved in drama. This article discusses Tollens’ translations of two plays written by the French author Pigault-Lebrun: Le cordonnier de Damas and Claudine de Florian. The texts belong to a genre which Dutch critics around 1800 disdainfully typified as a ‘middelding’ (‘in-between-thing’), a mixture of tragedy and comedy. As a translator Tollens did not take great liberties with Pigault’s texts: he probably didn’t find it necessary to adapt them to a Dutch audience, because he experienced the enlightened moral of these French plays as cosmopolitan. A truly national poet? Tollens from a transnational perspective. 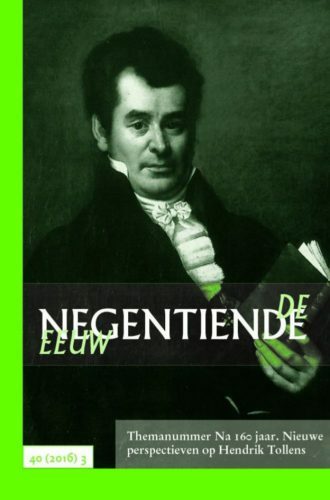 Hendrik Tollens (1780-1856) is usually considered one of the most nationalistic poets in Dutch literary history. He is mainly remembered for being the author of anti-French resistance poetry, patriotic poetry on historical topics of the Dutch past, and the national anthem. This article reconsiders his image as a truly national poet by discussing his work from a transnational perspective. An astonishing 46% of his oeuvre consisted of translations. What’s more, his original work was also deeply influenced by the writings of German, English and French poets. Tollens adapted some of their works to such an extent that they were perceived as typically Dutch. This process of cultural assimilation, which becomes visible by situating Tollens’s work in the wider European context, is the key to understanding the persistence of his image as a truly national poet. ‘Homely pleasures, childish babbling – no longer do I want to play them’. Hendrik Tollens as a history poet. Hendrik Tollens is known as the poet of everyday life. Even so, a large portion of his poetry deals with historical themes, thus fitting in with the ‘history addiction’ predominant in the arts of the early nineteenth century. In contrast with other, younger writers, who find historical fiction just as important for knowledge of the past as history writing proper, Tollens does not claim to do historical research. In his poetry he uses the past in two ways, as Arcadian scenery and as a kind of mobiliser. In the second variety he uses the past to call the present to action like, for instance, resistance against the French occupier or reconciliation between political or religious opponents. Poems like this may be characterised as ‘dual- timed’ – a characteristic they do share with the poetry of a younger generation. Modesty and Bilderdijkian awareness. The paradox of Hendrik Tollens’ selffashioning. Hendrik Tollens was the most famous poet of the early nineteenth century. Making use of the theory of self-fashioning this article demonstrates how Tollens constructed his literary image. This is a new approach, because Tollens was – contrary to more eccentric poets – never analysed in this respect. There is a strange paradox about Tollens’ self-fashioning. On the one hand he propagated modesty, on the other hand he embraced the idea of the furor poeticus, which he adopted from his idol Willem Bilderdijk. In this article, the curious tension between selffashioning and literary fandom is examined. Tollens at home and on the road. Hendrik Tollens and the material aspects of memory culture. Tollens’ work as a poet has largely vanished from collective memory since his death in 1856 and has been subject to endless and partly subjective abuse. This article addresses the material mementos involving Hendrik Tollens and focuses on three elements: the statues (Rotterdam, Rijswijk), public collections, and namegiving, including those of streets. In all of these cases the conclusion is that the material memories need to be conserved, made accessible and be provided with explanations so they will function as such for future generations.